COL Cheryl A. Elliott-Dawe and COL(R) Paul Kondrat. 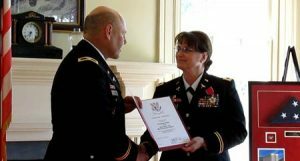 Family and friends gathered at the Greene County Historical Society’s Vaughn-Morrow House in Eutaw, Ala., on July 19 for the retirement of COL Cheryl Ann Elliott-Dawe from the United States Army Nurse Corps following more than 30 years of service. COL Elliott-Dawe and her husband Dr. Lloyd A. Dawe who is an employee of the University of South Carolina Aiken are residents of Johnston, SC. Following an invocation by the Rev. Rick Williams of Eutaw Baptist Church, it was noted that COL Elliott-Dawe continues a long family lineage of military service; she is a direct descendant of patriots who served WWII, WWI, the Civil War, and the Revolutionary War. A native of Eutaw, COL Elliott-Dawe returned home for her retirement in acknowledgement of the significant impact her church, community, teachers, friends and family have had on her life and career. During the ceremony, COL Elliott-Dawe was awarded the Army Medical Department’s 30 year Medallion, and the Legion of Merit medal for exceptionally meritorious service by the presiding officers COL (R) MaryAnn Monteith and COL (R) Paul Kondrat, joining such notables as General Patton and General Eisenhower and heads of state who have been awarded this high honor. Other presentations included certificates and personal letters of appreciation from the President of the United States, Barack Obama; the Chief of Staff, United States Army, General Raymond T. Odierno; the Surgeon General and Commanding General of USAMEDCOM, Lieutenant General Patricia D. Horoho; and the Chief of the Army Nurse Corps, Major General Jimmie O Keenan. Following a moving flag folding ceremony conducted by COL MaryAnn Monteith; COL Paul Kondrat; MSgt Robert “Skip” Rozelle, Jr.; her father CPL William Elliott, Sr., a veteran of WWII; and her nephew PFC Josh Curtman, the national flag was presented to COL Elliott-Dawe in appreciation of her service to the nation. Certificates of appreciation and gifts were also presented to her parents, William and Minnie Elliott; her husband, Dr. Lloyd A. Dawe; and her children Ashley, Graeme, and Jeffrey who were in attendance. During her years of service, COL Elliott-Dawe’s assignments included the Nurnberg Army Hospital in Germany; Reynolds Army Community Hospital in Fort Sill, OK; Womack Army Medical Center in Fort Bragg, NC; Darnall Army Medical Center in Fort Hood, TX; Dwight D. Eisenhower Army Medical Center in Fort Gordon, GA; and the William Beaumont Army Medical Center in Fort Bliss, TX. COL Elliott-Dawe was deployed with the 47th Field Hospital to the Middle-east in support of Desert Storm / Shield in 1990-91; to Egypt in support of Operation Bright Star in 1994-95; and to Haiti in 1995 in support of Operation Uphold Democracy. From 2011-13, she served as the Deputy Commander Nursing for the 31st Combat Support Hospital. Her military awards include the Legion of Merit, 3 Meritorious Service medals, 5 Army Commendation medals, 3 Army Achievement medals, 2 National Defense Service medals, the Armed Forces Expeditionary medal; the Armed Forces Service medal, 2 Humanitarian Service medals, the Armed Forces Reserve medal, the Army Service medal, 2 Overseas Ribbons, the United Nations medal, the Saudi Arabia-Kuwait Liberation medal, the Kuwait Liberation Medal, the Artillery Order of Molly Pitcher, and the Order of Military Medical Merit. COL Elliott-Dawe also holds a rare 9A designator in Perioperative Nursing, recognizing her as a national expert in the field.